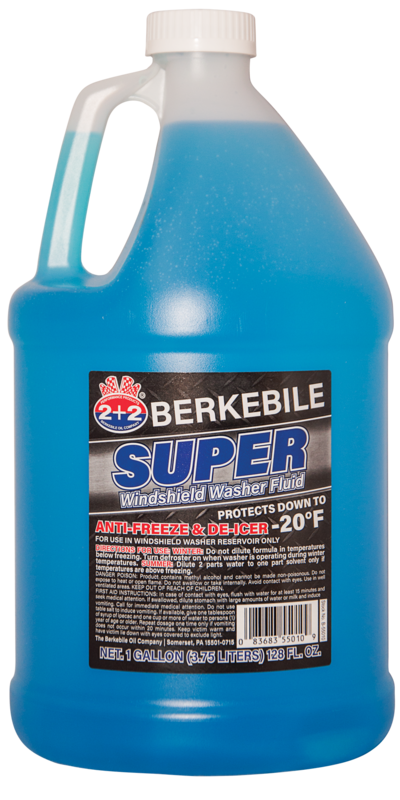 The Berkebile Oil Company’s Super Windshield Washer Fluid Anti-Freeze & De-Icer is formulated using high-quality chemicals and components. Super Windshield Washer Fluid will clean and prevent your windshield washing system from freezing, down to -20˚F. REMOVES OIL, GRIME, DUST, BUGS, AND ROAD DEBRIS! BREAKS UP & BEADS RAIN! During the winter months: use Super Windshield Washer Fluid at full strength for cold weather protection down to -20˚F. During the summer months: dilute 1 part Super Windshield Washer Fluid to two parts water.